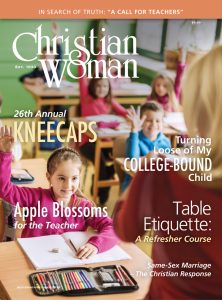 Every issue of Christian Woman magazine contains an 8-lesson topical Bible study, based on the issue’s theme. The September/October 2015 issue of CW is about teachers and their value to all generations. This issue’s study is “A Call to Teachers.” The first lesson is posted here as a sample. Call 1-800-251-8446 or click here to order CW. The lessons are available for separate order.